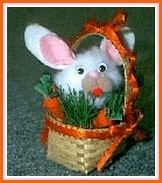 This little pompom bunny in his cheerful little Easter basket is cousin to our Hangin’ In There Pompom Bunny. Both bunny faces are made from pompoms of various sizes. With this version, there’s no need to make the bunny body as all you can see is a bunny face peeking out of the Easter grass. 1. Cut two identical spoon shaped pieces of white felt, about one inch long, for the bunny ears. Cut two smaller spoon shaped pieces in pink felt. Glue the pink ear piece to the larger white piece at the bottom of both pieces, pinching the sides together until the glue holds, so that the ears curve inwards a little bit. Set aside. 2. On the 2 inch pom pom, which is the bunny’s head, glue the two tan or grey pompoms, placing them together for the cheeks. 4. Glue the tiny pink pompom on top of the two tan pompoms, then add a tiny red pompom for the tongue. 5. Glue the eyes in place above the nose. 6. Glue the two ears on top of the 2 inch pompom. 7. Prepare the basket by gluing easter grass inside it, so the grass appears above the basket rim, as shown. 8. Separate an area of the grass where you want the bunny to go, apply glue to the bottom of the bunny and press gently into place. 9. Add the two small carrots or other embellishments. 10. Finally, glue a narrow length of ribbon around the rim of the basket and over the handle. Finish with a small bow or two made of the same ribbon.